When we stumbled upon our ‘The Origins Of‘ canvas print on Instagram we knew we had struck styling gold. 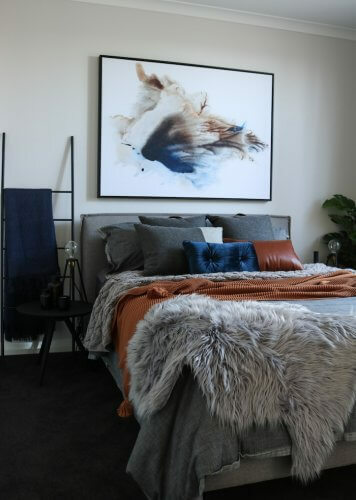 The colour palette of this bedroom created by Kelly of 13 Interiors was literally a perfect match; our artwork has found its dream home. 13 Interiors has been involved in a large variety of projects and has a particular interest in creating beautiful spaces that are original and practical, whilst understanding individual requirements, budget, personality and style. Kelly draws her inspiration from new materials, trends, unique spaces and happy clients. A love of great design and attention to detail is the driving force behind Kelly’s amazing work – and we are surely glad she found us, and we found her, on Instagram! 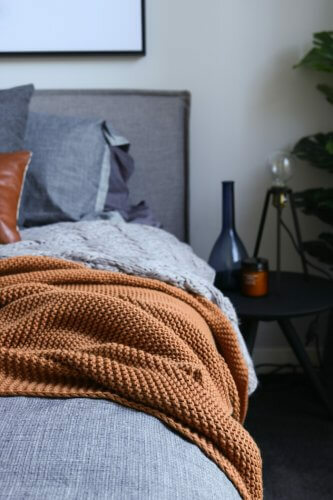 We sat down with Kelly to pick her brains about choosing art, colour palettes, styling bedrooms and all things design! Here are Kelly’s top tips and advice for searching for that key art piece that makes your house feel like a home. UI: What’s your approach to buying artwork? Kelly: If you love it buy it! I’m talking about that stand out art piece that caught your eye and that you’re now dreaming about, it had you at hello didn’t it. Like a lot of things in our lives we are attracted to things because of its look, feel or vibrancy and why would art be any different. I always find that when clients are looking for that dream piece they are first consciously thinking about a colour scheme and then trying to make that piece fit. Which, don’t get me wrong, can be an option to choosing art, but I always recommend choosing a piece because you actually love it. Don’t get caught up in trends or fads. Instead, get caught up in the emotion of that stellar piece, you’ll thank yourself every moment that you walk by it in your home. UI: How do you approach selecting colour palettes for a room? Kelly: Once that key art piece has been chosen, I like to use the 60-30-10 colour philosophy as a guide. With the main colour being 60% of the room, the second 30% and then the contrasting touches is the final 10%. I’ve used this key rule when applying the colour palette and styling to this bedroom with the stunning The Origins Of print from the Alisa & Lysandra range. This colour philosophy creates consistency, balance and harmony. These are elements of design that are essential to making your space flow all connected by that art piece you love. UI: How do you decide on the size of the canvas? Kelly: When it comes to the sizing of your art, I always say bigger is better! Often the art choice will be the key focal point to your room and focal points are called ‘focal’ for a reason. Always measure your space and the wall that it will be positioned on. Common rule of thumb is to cover 2/3 thirds of this space and always aim to have it hung at eye level. If you’re spending the money on an amazing piece you don’t want to hang it to find that it’s too small, leaving the room to completely look out of proportion. If the size isn’t right then you’re not giving this piece its opportunity to shine. So there you have it. Straight from the stylist’s mouth. We hope Kelly’s key tips help you hunt down that perfect key piece to make your home complete. 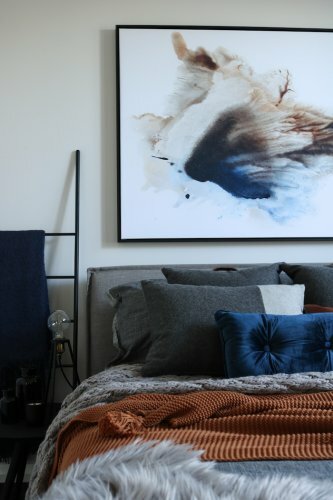 Kelly used our handy search function on the United Interiors website when selecting her client’s bedroom artwork. You can search by colour palette, orientation and subject on the left hand side, making the tough selection process just that much easier.